In some projects, it’s smart to cut out the middleman and save on costs by going DIY. However, some DIY jobs like HVAC maintenance and repair can turn into a costly disaster. Without the right skill set and tools for HVAC maintenance and repair, an individual might do more harm than good and even put him or herself in danger. If you’re looking for Colorado HVAC services, turn to none other than AppleAire Heating & Cooling. We are dedicated to helping improve the efficiency and comfort of your home. When you hire us, we’ll take the time to listen to your concerns so we can make sure that we’re acting in your best interests. Professionals can handle almost any problem. HVAC service specialists may have taken on and solved the problem you’re currently facing many times. They most likely know what to do to fix your problem in the best way possible. Experience has taught these CO HVAC specialists the ins and outs of the field, which is why there’s almost no issue that is too hard or complicated for them. Professionals have access to the right equipment. If you take a DIY approach to HVAC maintenance, you’ll need the right tools to get the job done. You also need at least basic knowledge of how to use them. Think of that in terms of the time and money you have to put in. When you hire CO HVAC specialists, you don’t need to buy or rent HVAC maintenance and repair equipment. HVAC service experts will show up with industry-leading HVAC maintenance and repair tools, which will help them complete their work in as little time as possible without compromising quality. Professionals help keep you safe. Hiring a certified CO HVAC specialist may be the safest and most secure option for you. CO HVAC systems are made up of parts that emit potentially dangerous gases to maintain the right temperature in your house or office. If these components are mishandled, they might harm you, your family, and anybody else who is inside your home. View maintenance tips here. HVAC Professionals help you save time. HVAC maintenance and repair can consume more time than it should, especially if you don’t have experience in what you’re doing. Even if you did invest this kind of time in your HVAC maintenance and repair project, there’s no guarantee you’ll get the results you’re expecting. If you want to be efficient, working with a CO HVAC expert is the way to go. 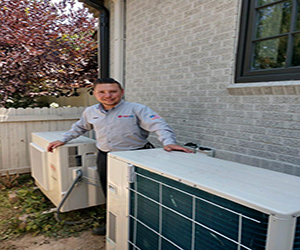 CO HVAC technicians have spent years working on heating and air conditioning systems. This means that they have developed the skill to address CO HVAC issues in a minimum amount of time. In most cases, these CO HVAC technicians will be in and out of your home, letting you get back to your normal routine as soon as possible. HVAC Professionals bring their expertise to the table. Proper HVAC maintenance and repair takes extensive and specific training to understand and carry out. One miscalculation may cost you and endanger those around you. For your safety and peace of mind, enlist the help of an HVAC maintenance and repair technician. HVAC service professionals know what signs and factors in air conditioning and heating units to look for when performing their work. They can think on their feet and go the extra mile to do their job right the first time, every single time. The fewer the errors there are, the less the incurred cost will be and quicker the project can be completed. Are you experiencing issues with your heating or air conditioning unit? Trust only AppleAire Heating & Cooling. Our technicians have a solid background in HVAC repair and servicing. We also have enough man power and tools to provide the best solution to your needs. Get in touch with us today to learn more. Click here to learn more about us.